Working out is unimaginable without some good music playing in your ears while you pump those muscles and work those legs. The whole process is bizarrely arduous as it requires all your will-power, and then some. 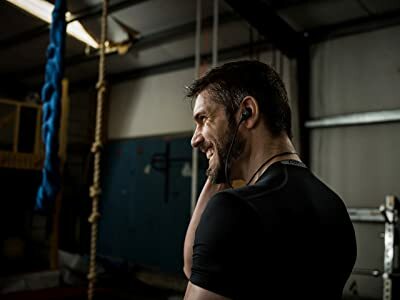 Every fiber of your fighting the battle, and in the end, you come out stronger All this is much more exciting with a pair of comfortable, lightweight, pleasing headphones that keep playing your favorite music and keep you motivated. Best headphones for working out, fortunately, are not a myth. They exist. They let you work out without even letting you feel you are wearing something that interferes with your movements. 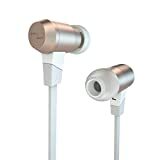 The mark of a great headphone pair for working out is that it can handle sweat, is lightest possible, does not annoy you and gives good playtime with a reasonable sound quality. 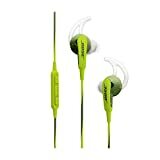 With these things in mind, we are going to let you in on the things to look for when buying headphones for working out. These little magical in-ear headphones are so light on your ears, and you won’t feel them at all. They weigh 0.6 ounces, and your ears are going to love them. Wear them while jogging, swimming, cycling or working out in the gym, they are perfect for any exercise. These headphones come with unique StayHear tips in small, medium and large sizes, so they fit in your ears perfectly and don’t fall out. So you can rest assured that they give you immense convenience and portability. You can fit them in your pocket and can wear them wherever and whenever you please. Being extremely lightweight and smart for the pocket, portability is a non-issue. Unlimited playtime because it is a wired headphones pair. Designed to be weather and sweat resistant, you can take it with you wherever you please without feeling obliged to care for it much. Put them in your ears and forget about them. The sound quality of these little bad boys is absolutely great. Bose uses TriPort technology to give you a crispier sound on high notes and a naturally grave sound on low notes. Crystal clear sound on calls too to make your multitasking easier. These headphones work best with Apple devices. You can control your music and answer your calls from the in-line mic/remote. 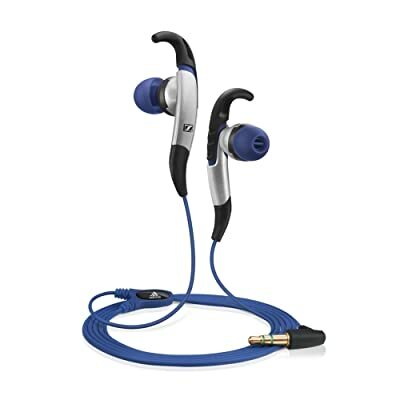 Sennheiser CX is an in-ear lightweight headphones that will be a perfect fit for your workout regimes. It offers a Slide-to-Fit mechanism that makes it very easy to wear and EarFin to keep them there while you are working your rigorous exercises. 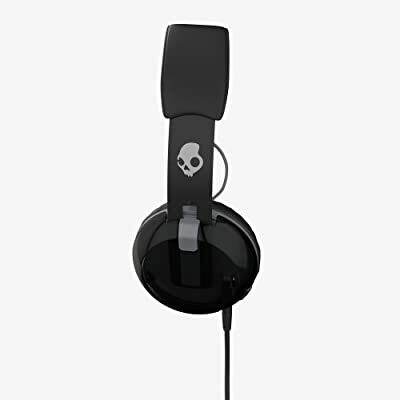 On the convenience department, this pair of headphones is super-awesome. It also has Para-aramid-reinforced cables that make sustain extreme condition and durable. Being a littler heavier than the previous one, it makes no significant difference and will be a breeze to wear. The additional mechanism adds a couple of ounces to the entire weight, but they make up for it in the durability and convenience of the things. These headphones are wired so that they can give you unlimited playtime. But that unlimited playtime comes with just a little extra inconvenience which Bluetooth headphones free you off. These headphones are water and sweat resistant and will allow you to push through your routine and not care about your headphones at all. The sound quality of these headphones is at par with the others in this league. With crystal clear sound and heavy bass, it certainly is one of the best headphones we have reviewed in context to the sound quality. It’s acoustically closed design is perfect for your music, calls and can handle sweat and rigor however you throw them at it. These extremely lightweight Bluetooth headphones come with a very different design. They weigh just 0.6 ounces and are a delight to wear. Having Bluetooth headphones is perfect for working out. 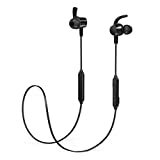 Its snug fit design lets you play sports without the worry of them falling out of your ear. They are convenient and extremely portable. Having wireless headphones has its charm – you can do your jumping jacks, your lungs and chins up freely. Also, playing different kinds of sports will allow you to play the game while pumped on your favorite jams. Also, training for boxing will become a breeze with these wireless headphones. 8 hours of music and calls let you go through your day while having these nifty little in-ear headphones helping you out. You can take them to the gym, play tennis wearing them or can simply relax in your hot steam bath with some soothing music, and it will run with you for all these activities. Sweat resistance is a necessary feature all our featured headphones and these headphones are IPX5-Rated water resistant. You can take them swimming or can work out until your muscles are sore, and these headphones will stay in your ears, strong as ever. The sound quality of these headphones is premium. Patented 10mm driver give you high-quality music streaming. You can play AAC and aptX super high-quality audio streaming these headphones. Its dual device connectivity will allow you to use it with two devices without needing to switch the Bluetooth access between the two. At 0.6 ounces, they are about the same weight as the others we have reviewed. Extremely portable, absolutely wireless and exceedingly durable – these headphones are perfect for your workout sessions and exercises. TaoTronics 7 hours of playtime gives you an incredible and ample time of your favorite music, packed in your mobile phone or music player. Bluetooth/wireless headphones often suffer short playtimes and thus become very annoying for people who use it in outdoorsy activities. Working out, exercising and playing games is a breeze when you have these great little headphones. It has an innovative sweat proof covering that makes it possible for you to use it in water-prone or sweaty conditions such as working out and exercising. You can exercise entirely care-free with these. After all, what is a workout if you do not sweat profusely? The sound quality of these headphones is truly crisp and gives you pleasurably superior sound. aptX codec allows you to stream high-quality music, anywhere you like. The CVC noise cancellation technology built into these little bad boys provides you crystal clear communication with an integrated mic designed to work in rowdy places. At 10.2 ounces, it is heavier than the others we have reviewed, but it is certainly worth the extra weight. 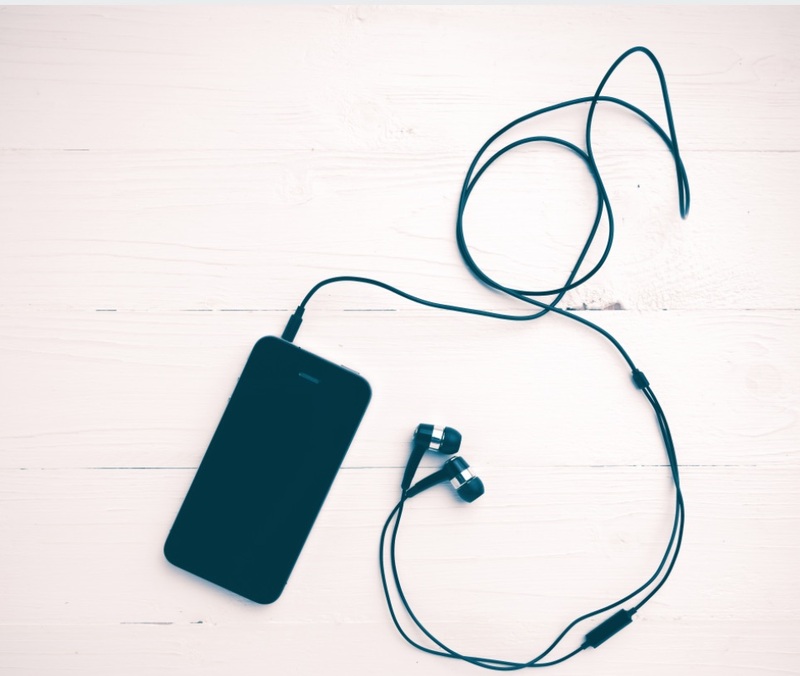 A little increment in weight does not necessarily mean you have to carry heavier and bulkier headphones; it’s just that the design makes it a little heavier and nothing your ears can’t handle. You will be delighted wearing these during your sessions and at no point will you be annoyed by them. You can fit them in your pocket, tuck them away in the side pocket of your backpack or just carry them in your hands; they will not be a nuisance to you. Jaybird’s patented Secure-Fit enhanced comfort sport ear pins make sure that your headphones stay where they should and don’t fall out during your rigorous workout regimes. Another trademark X-Fit allows you to fix the headphones under or over your ears. These headphones give you an 8-hour playtime over Bluetooth. 8 hours is enough time for an average day where you can listen to music and answer calls during your commute, free time and work out sessions. If you charge it completely during the night, it will be your companion for the whole day and keep blasting upbeat tracks in your ears. These headphones provide a lifetime warranty against sweat so you can while away your time exerting for countless hours. These premium headphones will give you carefree workout sessions and will allow you to listen to music all the time while you pump up those muscles. With its trademark Shift premium Bluetooth audio, you can be sure of the high sound quality these headphones offer. Moreover, with Jenna, the voice assistant, will play your favorite music with your voice commands. Wired headphones are popular because they are easy to carry and can fit in your pocket, all tangled up nicely and available whenever you want them without any battery worries. 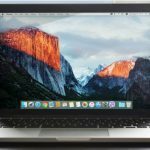 This is especially preferable for some people who do not like to go through the trouble of charging up their devices all the time. Portability isn’t a big issue with wired headphones, but convenience sometimes suffer. The wires tend to get entangled weirdly, and you might find yourself spending an awful lot of time untangling them. They can also be a hassle during your workout session. 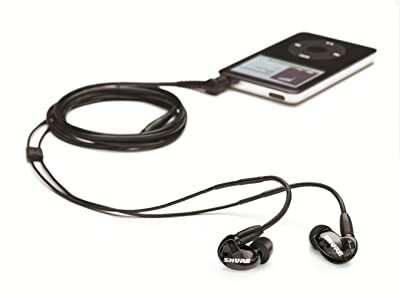 But these Shure headphones are designed to give you convenience and portability. These lightweight headphones fit in your pocket perfectly. They have a Detachable Cable with Wireform Fit that allows you to detach them and roll them up in your bag if you don’t want them to get entangled. Wireform fit and optimized nozzle angle will fit them perfectly in your ears and allow you to rest there without worrying you. The biggest edge wired headphones have over wireless ones is the unlimited playtime they offer. You can carry them around 24×7 and never have to worry about them drying up. They are ready-to-go, always. These headphones do not provide any concrete sweat resistant feature, but users are satisfied with them and use them for working out without any issues. Shure’s trademark Sound Isolating Sleeve gives complete background noise cancellation. Selection of foam and flex sleeves creates a comfortable seal and tends to block all background noise making it the perfect fit if you do not like gym music and prefer to listen to your own. Or if you just want to get in your zone while working out or exercising and want total focus without any background noise. Like all on-ear headphones, these might be inconvenient for some folks who get annoyed by carrying around these heavy headsets. They weight 8.5 ounces, so they aren’t that heavy, but comparing them to the others we have reviewed, they are bulkier and heavier. The Grind headphones make up for their heaviness by providing premium sound quality. Portability is also an issue with these headphones. You cannot carry them around in your pocket; that’s for sure, but if you have a backpack, they can fit in. Then again, most folks would prefer lighter and more carry-friendly headphones for their workouts and reserve these for lounging away their free time. These premium headphones will give you somewhere around 3-4 hours of playtime. The playtime is not impressive compared to other headphones we have reviewed which give you double the airtime of these headphones. They do not provide any real sweat or water resistance. But their plush foam ear pads will provide padding between your ear and the electronics so the chance of it was malfunctioning because of sweat is really thin. We cannot guarantee that it will work if you take it swimming, though. This is where these headphones shine. The sound quality of these headphones is great. The Grind headphones give a premium sound, powerful bass, and warm vocals. You can also attend calls, play or pause your music with the TAPTECH button located outside the ear-cup. The button also allows you to switch tracks which is a very nifty feature to have during workouts – you do not want to keep taking out your device and changing tracks every few minutes during your sweaty workout routines. 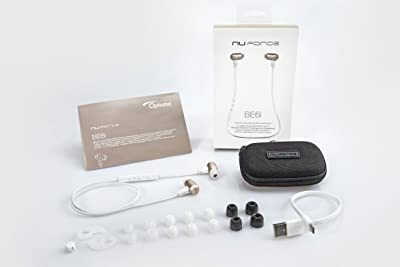 Headphones should be extremely lightweight, should fit in your ears perfectly and not fall out of them during your rigorous workout routines, and should have Bluetooth connectivity so that you do not have to the hustle and bustle with the dangling wires. In a case of Bluetooth headphones, playtime should be enough so that you do not run out of batteries and find yourself punching your knuckles straight into the gym mirror. Playtime has to suffice to last your whole gym session, your commute and then some. A workout session is set to make you sweat profusely, so make sure you buy the headphones that can endure this kind of sweaty treatment. 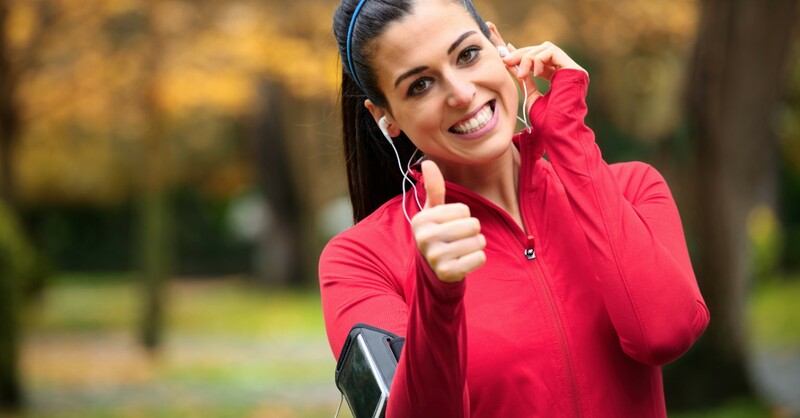 Sweat resistant headphones are a must for your workout sessions. 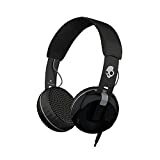 What is a pair of headphones if it does not come with excellent sound quality? Sound quality is the necessary foundation of any great headphones. Although we are focusing on headphones that work better in the workout and sporty situations, great quality can never be compromised. 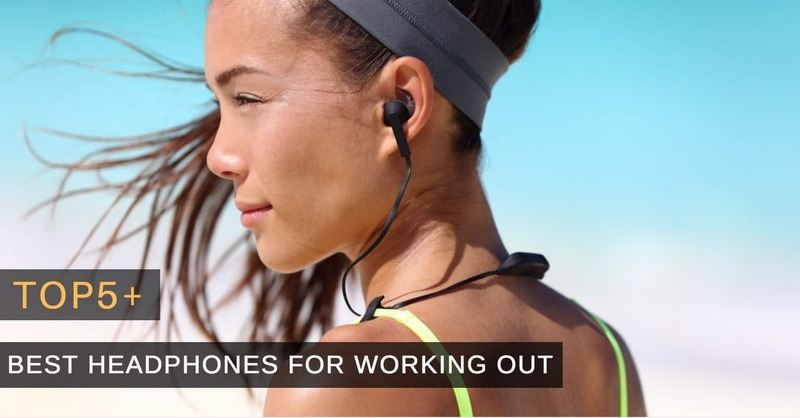 All these headphones provide various desirable features that you would want during your workouts. The headphones that are the most convenient and provide an ample playtime with a good sound quality would be perfect for workouts. Thinking along those lines, we would suggest lightweight wireless headphones with good playtime. You can choose among the top options we have shortlisted – they are the best available on the market right now. Headphones should also be durable because you cannot be worrying about them during your workouts as it will take all the fun out of it and will leave you distracted. They should be able to handle the rigor you would put them through in your workouts and still stay with you for at least a year. Consider these things and choose the one that works for you the best.